How ironic that I ended up having a complete bottomless pit stomach yesterday on Fat Tuesday. Huh, funny. I didn’t snap photos of all of my food yesterday because quite frankly I would have had to glue the camera to my hand. My day started off with a nice patriotic looking bowl of fruit and greek yogurt. 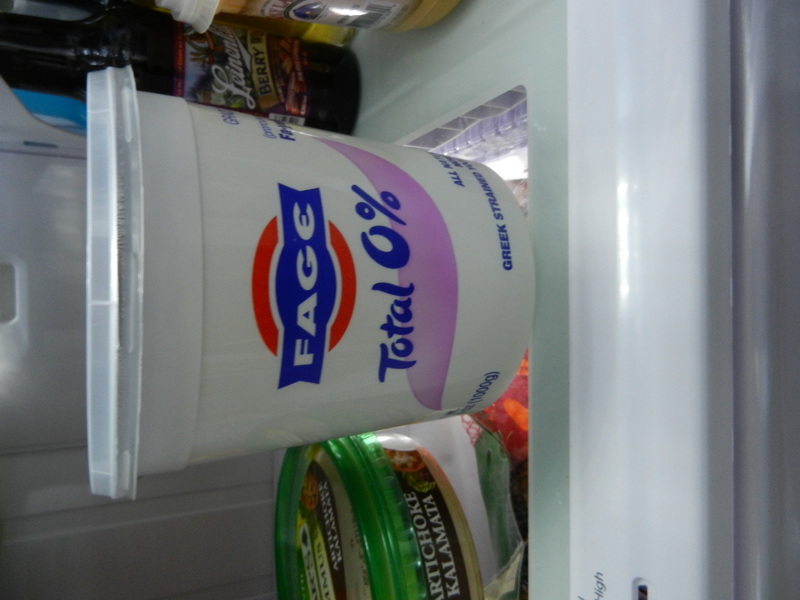 Btw if you are wondering, I typically buy FAGE (pronounced Fa-yeh) Total 0% all natural non fat greek strained yogurt. 23 whopping grams of protein! 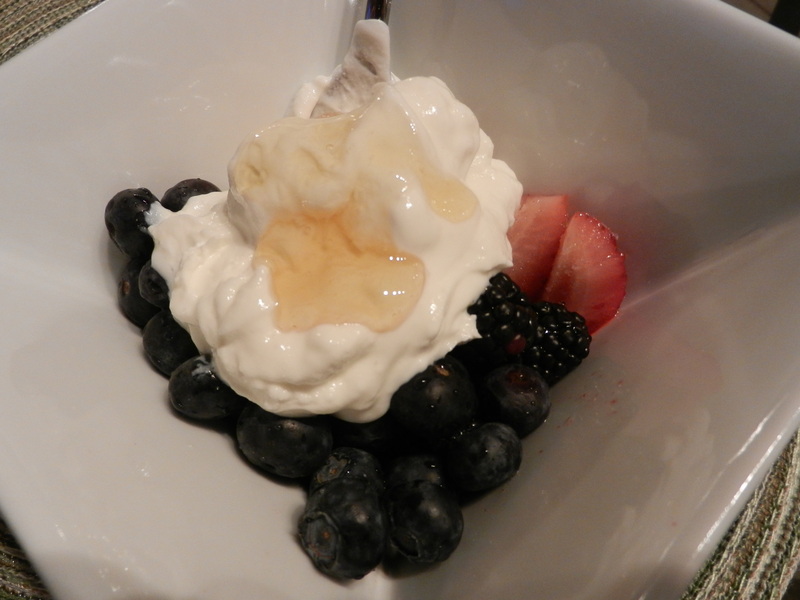 It’s obvious I really enjoy my yogurt sweetened with a little honey and mixed with a ton of fruit, but it can also be used as a substitute for sour cream, mayonnaise, cream cheese, etc. We have been going through it pretty quickly around our house. I worked until 1:00 yesterday so I had packed some snacks to tide me over until I got home for lunch. I packed a string cheese, apple, carrots, sugar snap peas, and a banana. I ripped through those snacks like it was no ones business and also had an Archer Farm’s fruit strip on the car ride home. I was going to go to the gym and then eat when I got home but I couldn’t make it. I needed MORE FOOOOOODD! I was like a tornado whipping through the kitchen. I immediately sliced off a piece of bread and slathered it in pb and J. I scarfed that down then headed to the pantry for a few handfuls of Special K blueberry cereal. I wanted more but decided I needed to cool it for a bit, especially if I was planning to get any sort of a workout in. My intentions were to go for a run on the treadmill. I started running but noticed a little pain in the outside of my left knee cap. I tried to keep running thinking I was just warming up and it would go away, but it didn’t. I turned my run into a 45 minute walk and then cranked out some abs and planks. I hope the pain goes away soon. I think it will. Anyway…back to the snacks again. I wanted to share with you this new hummus that we bought (new to me at least). 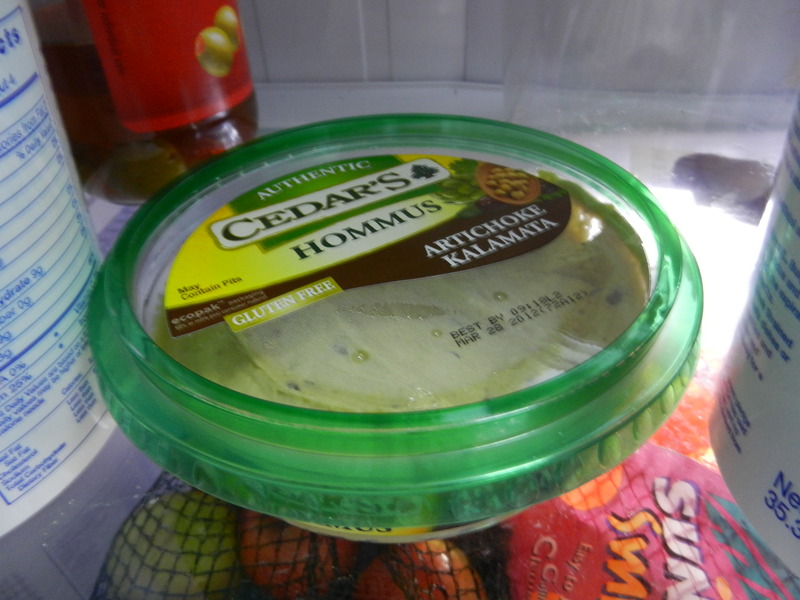 It is Cedar’s Artichoke Kalamata Hommus. Oh wow, I can’t begin to describe how good this stuff is but I’ll try. It is creamy and slightly salty with a hint of olive flavor and tiny specks of artichoke. 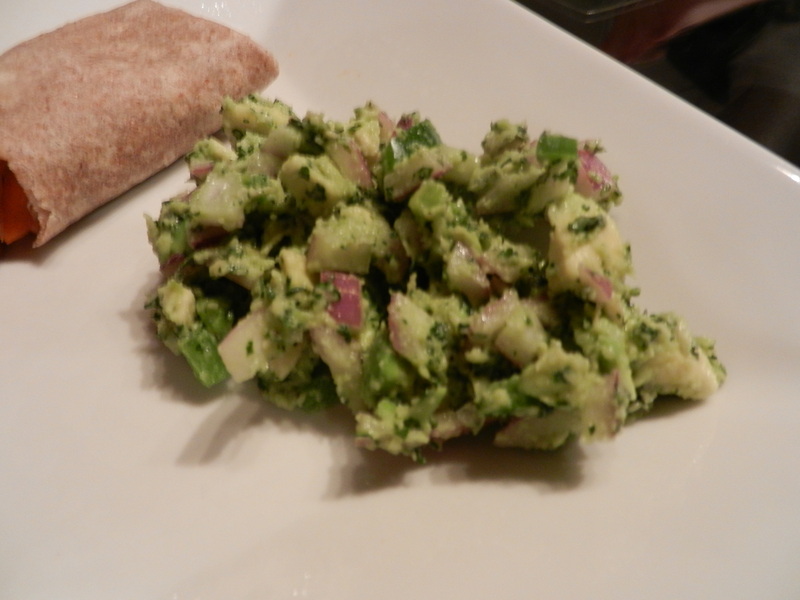 Perfect to dip crackers, veggies, or pita chips. If you ever see this stuff in your grocery store, give it a go. Now, where was I going with this post? Oh yes, dinner last night! My long-time friend, Kalley came over for dinner last night. We’ve been friends since the 8th grade. 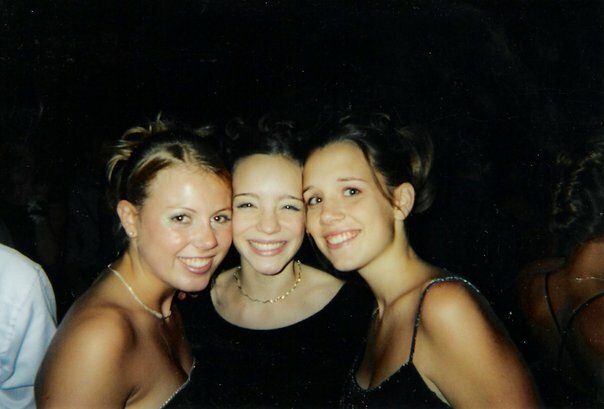 Back in the day we passed notes, gossiped about our biggest crushes, and danced and sang to N’sync and Britney Spears. Hmm, come to think of it, not much has changed. 😉 Except now we are passing texts, talking about husbands and real significant boyfriends, and still dancing and singing to JT (although I still have love for Britney too). It had been way too long since we had gotten together so we decided to hang out in our comfies and make dinner together. 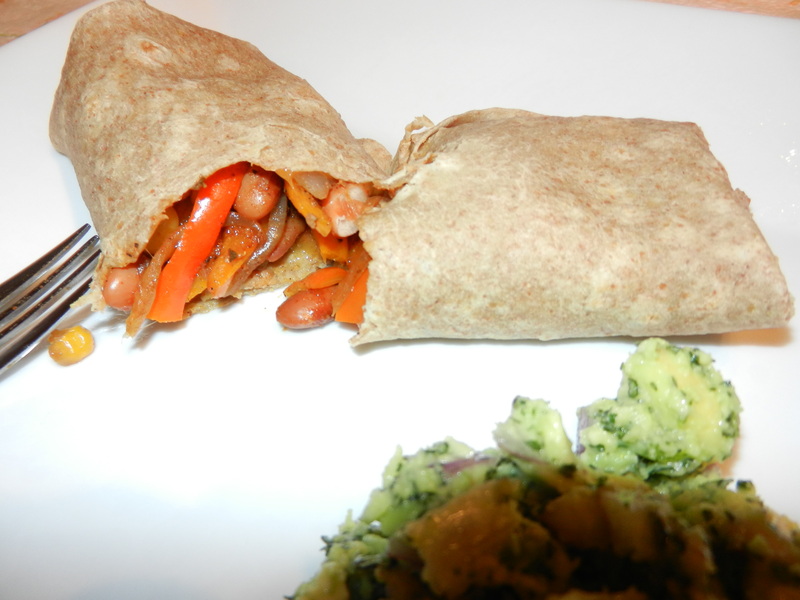 On the menu was veggie fajitas, guacamole and a whole lot of catching up! It was SO great catching up! Also, thanks for the books! I started reading Firefly Lane last night. Thanks for coming over Kal! After Kalley left, Dana and I had our last dessert before lent and it was a good one. 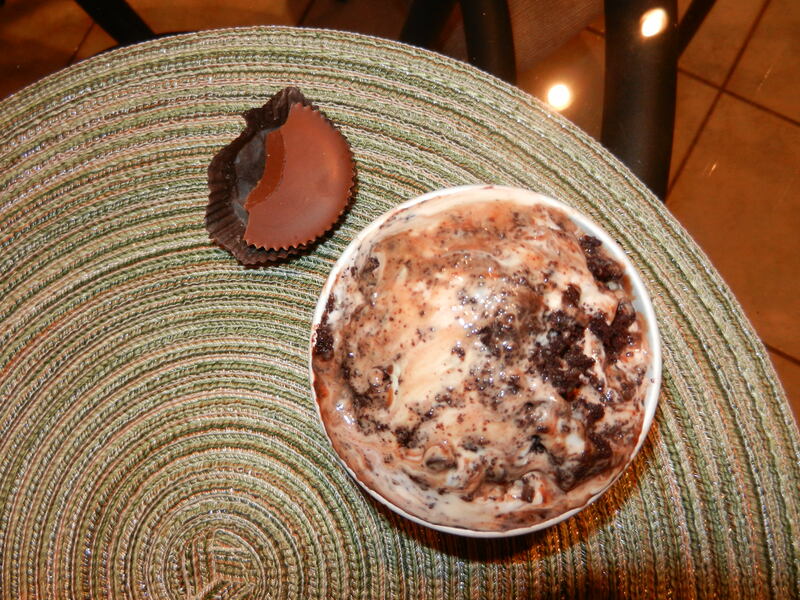 Coldstone ice cream (cake batter ice cream with brownies and other goodies) and a Reese’s Peanut Butter Cup. Just noticed the time. I still need to finish getting ready for work!I am out! Happy day! This entry was posted in Breakfast, Dinners, Fav Products, Friends, Sweet Treats and tagged chocolate, Ice Cream, sweet treats by Melanie. Bookmark the permalink.